Eileen is an Associate in the Litigation Practice Group. Her practice is primarily focused on Civil Litigation. Eileen also has experience in family law and criminal law. Eileen earned her J.D. at the University of Richmond School of Law, where she served as the Annual Survey and Symposium Editor for the Richmond Journal of Law and Technology. Eileen first practiced law as a third year student associate at the University of Richmond Children's Defense Clinic. Prior, she completed internships at the Henrico County Attorney's Office, the Chesapeake Bay Foundation, and the Legal Information Network for Cancer (LINC). 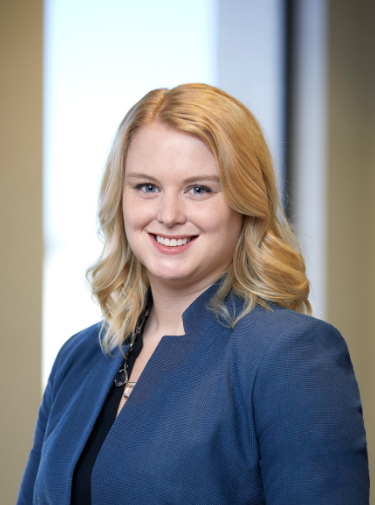 Before joining McCandlish Holton, Eileen worked as staff counsel for one of the nation's largest auto insurers, litigating in general district courts and circuit courts throughout the Commonwealth. Eileen also represented victims of domestic violence in all areas of family law, while working as a staff attorney for Legal Aid Works in Fredericksburg. Immediately following law school, Eileen was a post graduate legal fellow at the Petersburg Commonwealth's Attorney's Office.